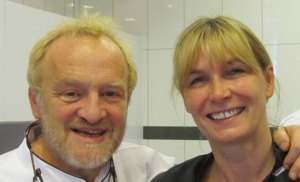 It is the throwaway remarks rather than the masterclass itself that makes an hour or two spent in Anthony Worrall Thompson’s company memorable, and the audience earlier today, here at the World Gourmet Summit in Singapore, weren’t complaining. Time and again the cookery demonstration took a back seat as he gave his opinion on all matters culinary, by way of anecdote, tale and joke. Somehow at the end of it all he managed to produce cauliflower and courgette fritters, fish fingers, stuffed aubergine and, quirky to the end, ‘prawn lollipops’. Anthony Worrall Thompson and his Irish wife, Jacinta. He has a secret weapon, of course, in the form of his Irish wife, Jacinta, and although she and I had never met before we quickly established that we grew up barely a stone’s throw from one another. She is a constant presence at his side, lending timely assistance thanks to the gift of telepathic anticipation. The ‘lollipops’ started with the prawns being threaded onto bamboo skewers and then fried in oil. They were then dipped into a garlic mayonnaise enlivened with saffron before being coated with popcorn. Popcorn? Yes, popcorn.